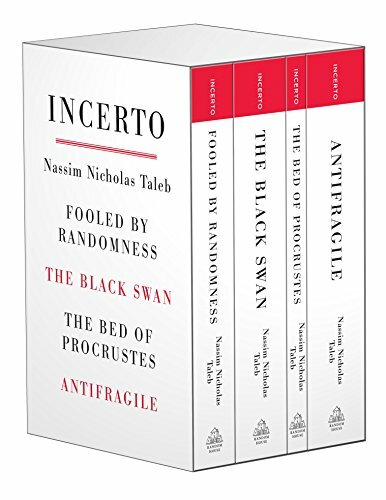 Nassim Nicholas Taleb’s landmark Incerto series is an investigation of luck, uncertainty, probability, opacity, human error, risk, disorder, and decision-making in a world we don’t understand, in nonoverlapping and standalone books. All four volumes—Antifragile, The Black Swan, Fooled by Randomness, and the expanded edition of The Bed of Procrustes, updated with more than 50 percent new material—are now together in one boxed set. Just as human bones get stronger when subjected to stress and tension, many things in life benefit from disorder, volatility, and turmoil. What Taleb has identified and calls “antifragile” is that category of things that not only gain from chaos but need it in order to survive and flourish. The resilient resists shocks and stays the same; the antifragile gets better and better. What is crucial is that the antifragile loves errors, as it incurs small harm and large benefits from them. Spanning politics, urban planning, war, personal finance, economic systems, and medicine in an interdisciplinary and erudite style, Antifragile is a blueprint for living in a Black Swan world. A black swan is a highly improbable event with three principal characteristics: It is unpredictable; it carries a massive impact; and, after the fact, we concoct an explanation that makes it appear less random and more predictable. The astonishing success of Google was a black swan; so was 9/11. In this groundbreaking and prophetic book, Taleb shows that black swan events underlie almost everything about our world, from the rise of religions to events in our own personal lives, and yet we—especially the experts—are blind to them. Are we capable of distinguishing the fortunate charlatan from the genuine visionary? Must we always try to uncover nonexistent messages in random events? Fooled by Randomness is about luck: more precisely, about how we perceive luck in our personal and professional experiences. Set against the backdrop of the most conspicuous forum in which luck is mistaken for skill—the markets—Fooled by Randomness is an irreverent, eye-opening, and endlessly entertaining exploration of one of the least understood forces in our lives. This collection of aphorisms and meditations expresses Taleb’s major ideas in ways you least expect. The Bed of Procrustes takes its title from Greek mythology: the story of a man who made his visitors fit his bed to perfection by either stretching them or cutting their limbs. With a rare combination of pointed wit and potent wisdom, Taleb plows through human illusions, contrasting the classical views of courage, elegance, and erudition against the modern diseases of nerdiness, philistinism, and phoniness. If you have any questions about this product by Random House Trade Paperbacks, contact us by completing and submitting the form below. If you are looking for a specif part number, please include it with your message.